The scene is charming, idyllic and bucolic. A young lady is resting a moment from her stroll. She basks in the delights of nature under the shade of a parasol held for her by her young exotic page. This full-size projection is the reflected image of our imagination and of our nostalgia: for an age of innocence and weightlessness, for an idealized country life, for the seductions of exoticism. But what for some represents access to a form of Ideal, is for others the mere continuation of servitude. The page is like a negative image. The cloth of his costume has been mended, cut and reworked over and over – revealing never-ending labor. With a needle and thread, tears have been repaired, and heteroclite morsels have been pieced together with textiles from India, Cambodia and West Africa. Time and its damages are visible and palpable. Evidence of stitching grooves the material, like scars on the body of a child-servant. It also becomes a metaphor for the narrative fabric reworked many times over: our history and its legacy. Beneath the dichotomy between the light-hearted and luminous life of the few, and the labor of those who make it possible, lies the extreme violence of our denial. 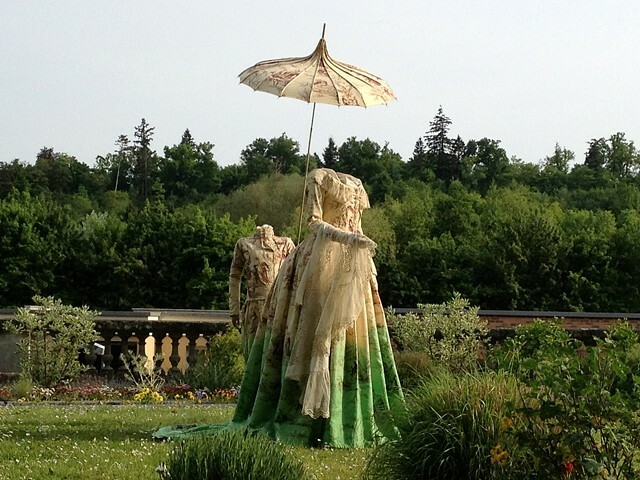 Pastorale, an installation for the Toile de Jour Museum, Jouy, France.